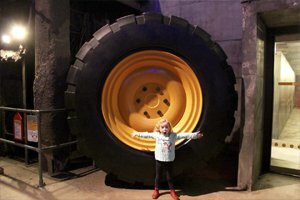 We invited Emma (from the blog @EmmaPlusThree) and her lovely family to enjoy a day out at Magna Science Adventure Centre during the February half term. 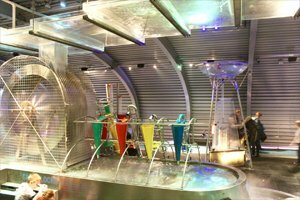 Earlier this week we headed to Magna Science Adventure Centre and Magna Mayhem. We have actually been once before but that was a couple of years ago now and the children couldn’t really remember it. As the kids are now four and six I thought this would be a great educational day out for them and perfect as it’s indoors and the weather was rubbish! 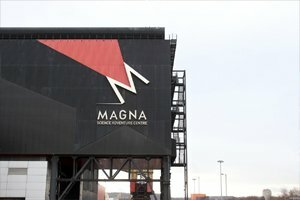 If you haven’t heard of Magna before it’s a science centre set in the former Templeborough steelworks in Rotherham. 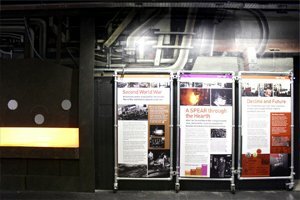 Children get to explore and discover science, technology, design and also learn about the industrial history of the area. Magna is split into four different pavilions – fire, air, water and earth. 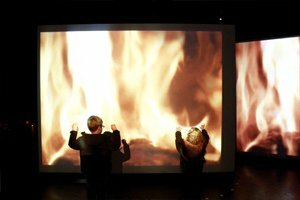 We headed to the fire pavilion first where the kids got to learn about heat and how it causes change. The main exhibit here is the fire tornado which is pretty impressive and the kids were completely fascinated by it. After fire we headed to the air pavilion which is set in a giant suspended Zeppelin! The children got to learn all about how sound works with some really cool experiments. Next up was the water pavilion, which was probably the kids favourite part. They had lots of fun splashing around in the water, but remember to either take a change of clothes or waterproofs with you as it’s unlikely your children will stay dry! Finally we headed to the last pavilion – earth which is probably the biggest of the four with lots to keep the children entertained. They got to don their hard hats and operate real life JCBs! There’s also a sandpit in this pavilion which is great for younger kids. Although a lot of Magna is aimed at older children and the educational aspect, don’t be put off if you have toddlers as there is still lots to keep them occupied too. We had lunch in the cafe which was nice – there was a good variety of food to choose from, the children enjoyed the kids boxes and the service was fast. I highly recommend the pork and stuffing baguette, which was delicious! After lunch it was time for Magna Mayhem which is said to be Yorkshires biggest and best indoor inflatable adventure zone. 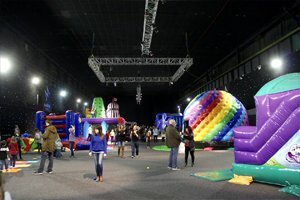 Children get to enjoy a whole 75 minutes of sliding, jumping, bouncing and bopping. The kids had SO much fun here and haven’t stopped talking about it since. I won’t lie, I’m a little bit sad that I wasn’t allowed to join in with the fun! My inner child was dying to get involved. Also worth mentioning is the outdoor playground and water park which is pretty big and would be perfect for the kids during the summer months. It was too cold and wet for us to play this time but we will be back once the weather improves. 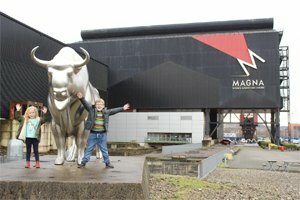 Overall we really enjoyed our day at Magna and would definitely recommend it. Especially at this time of year when you’re looking for something to do indoors. It’s fun for the children but I like that they were learning too. I also really like that after you’ve paid once for entry you get an annual pass, which I think is fantastic value. 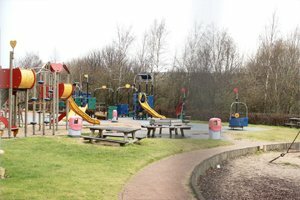 We can’t wait to go back during the summer to have a go in the outdoor playground. Entry to Magna is £10.95 for adults, £8.95 for children aged 4 and over and £4.50 for children aged 2 or 3, under 2’s go free. Prices include 12 months entry on completion of an annual pass form. Find out more here. 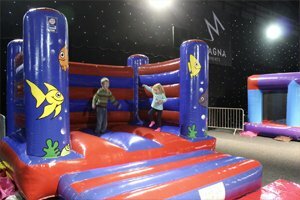 Magna Mayhem is open during school holidays and the standard price for a child age 4 – 15 is £9.95. For more pricing options visit their website here. If you’d like to read more about Emma’s Emma Plus Three and her family blog in Yorkshire, click here. Please note any views expressed on Emmaplusthree blog does not reflect the view of Yorkshire Attractions or its individual attractions.